Authors can design interactivity into a scene that responds to user actions. A scene can sense when the viewer's cursor is over a shape, has touched a shape, or is dragging atop a shape. A scene can also trigger animations on a viewer's touch, enabling the viewer to move and rotate shapes. There are four main action sensor types: TouchSensor senses touch, SphereSensor senses drags in a spherical way, CylinderSensor senses drags cylindrically, and PlaneSensor senses drags around a plane. Figure 09 1 Spinning Cube Touch Sensor A cube that spins when the cursor moves over it. Also see Figure 9.2 for comparison. Figure 09 1 Spinning Cube Touch Sensor With Axes A cube that spins when the cursor moves over it, with coordinate axes superimposed to show X3D/VRML directions. Also see Figure 9.2 for comparison. Figure 09 2 Spinning Cube Touch Sensor Clicked A cube that spins when the viewer touches it. Also see Figure 9.1 for comparison. Figure 09 2 Spinning Cube Touch Sensor Clicked With Axes A cube that spins when the viewer touches it, with coordinate axes superimposed to show X3D/VRML directions. Also see Figure 9.1 for comparison. Figure 09 3 Cone Plane Sensor A Cone that translates in the vertical XY plane when the viewer drags it. Also see Figure 9.4 for comparison. Figure 09 3 Cone Plane Sensor With Axes A Cone that translates in the vertical XY plane when the viewer drags it, with coordinate axes superimposed to show X3D/VRML directions. Also see Figure 9.4 for comparison. Figure 09 4 Cone Plane Sensor Constrained A cone that translates within a limited range of the XZ plane when the viewer drags it. Also see Figure 9.3 for comparison. Figure 09 4 Cone Plane Sensor Constrained With Axes A cone that translates within a limited range of the XZ plane when the viewer drags it, with coordinate axes superimposed to show X3D/VRML directions. Also see Figure 9.3 for comparison. Figure 09 5 Four Stacking Blocks Four stacking blocks, select and drag to see each of them. Figure 09 5 Four Stacking Blocks With Axes Four stacking blocks, select and drag to see each of them. 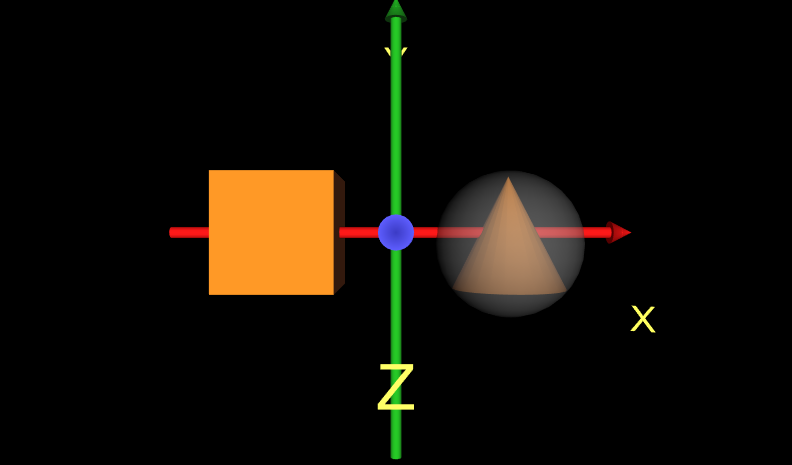 Coordinate axes are superimposed to show X3D/VRML directions. Figure 09 6 Sphere Sensor Two shapes that rotate when the viewer drags them, with coordinate axes superimposed to show X3D/VRML directions. Figure 09 6 Sphere Sensor With Axes Two shapes that rotate when the viewer drags them, with coordinate axes superimposed to show X3D/VRML directions. Figure 09 7 Cylinder Sensor Two shapes that rotate about an axis when the viewer drags them, with coordinate axes superimposed to show X3D/VRML directions. Figure 09 7 Cylinder Sensor With Axes Two shapes that rotate about an axis when the viewer drags them, with coordinate axes superimposed to show X3D/VRML directions. Figure 09 8 Click Drag Touch Sensor Plane Sensor Two shapes that rotate about an axis when the viewer drags them, with coordinate axes superimposed to show X3D/VRML directions. Figure 09 8 Click Drag Touch Sensor Plane Sensor With Axes A cube that spins when the cursor moves over it and translates when the cursor drags it, with coordinate axes superimposed to show X3D/VRML directions. Figure 09 9 Desk Lamp A desk lamp with arm angles that can be adjusted using nested sensors. Figure 09 9 Desk Lamp With Axes A desk lamp with arm angles that can be adjusted using nested sensors, with coordinate axes superimposed to show X3D/VRML directions.